The December issue of Shma Now features the artwork of Tanya Fredman. In an election dominated by stories of hypocrisy, deception, lying, sexual misconduct, secrecy, fake news—and much more—we at Sh’ma Now find ourselves thinking about the Jewish sensibility of “yetzer ha’ra,” the evil inclination. While the drama of the election is over, hate crimes are increasing, tried and true modes of political civility are being cast aside, and truth seems to be more elusive than ever. Our vigilance in naming and responding to the yetzer ha’ra will be tested, and we hope this issue gives you, our readers, a place to begin. This month, I’ve curated an issue that explores evil and the inclinations that drive us forward. In our simulated Talmud page, NiSh’ma, Robert J. Saferstein, Rabbi Sheila Peltz Weinberg, and Rabbis Raysh Weiss & Jonah Rank explore the verse from Pirkei Avot, “Ben Zoma said: ‘Who is strong? One who masters his impulse/inclination (yetzer)…Who is rich? One who rejoices in what s/he has.’” (4:1) In examining strength and wealth, our commentators consider the relationship between our impulses and our satisfaction with what we have. Consider and Converse is our robust guide to the issue and framework for discussion and learning. Take a look at the open-ended questions and bring them to your Shabbat table for discussion. What does Jewish wisdom teach us about accepting our inclinations and also channeling them? How does a binary approach to moral struggle, and to our inclinations, limit or enrich Jewish thought? How does God’s maturation map onto the maturation of humankind? Originally from St. Louis, Missouri, Tanya Fredman studied studio art at Brandeis University. She has also lived in Rwanda and New York City. 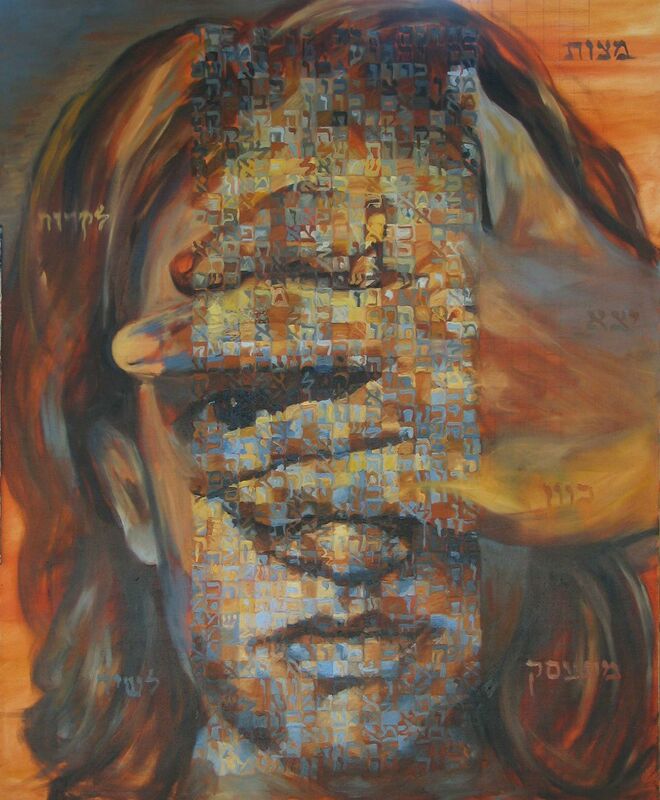 She moved to Israel in 2011 and completed postgraduate studies at HaMidrasha School of Art. She currently works in her studio at Kibbutz Ein Shemer and lives in Pardes Chana with her husband and their two-year-old son. Fredman teaches art at the Yemin Orde Youth Village and directs community murals and projects. Her work explores connections between different types of people that lead to a richer co-existence and to a more profound self-understanding.